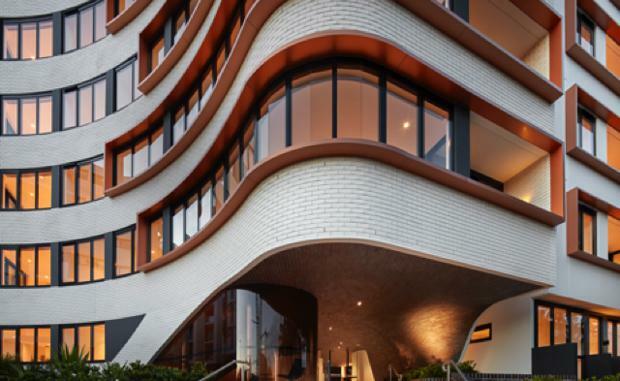 Developer Fridcorp has completed construction of its first Sydney-based, multi-residential project, Eve. Fridcorp joined forces with long-time joint venture partner Wingate to deliver the $160 million project on the corner of Eve and Macdonald Streets in Erskineville, a growing suburb in Sydney’s inner west. “We’re very proud of Eve – from its exceptional design to its high-quality interiors and the development’s exemplary communal spaces. We think the project demonstrates that Sydney’s apartment planning guidelines allow for the realisation of excellent design,” says Paul Fridman, founder and director of Fridcorp. Designed by architecture firm DKO, the project is set on 8,000 square metres and is a mix of 197 one, two and three bedroom apartments across four buildings that vary from four to six levels. The apartments range from 50 to 110 square metres and were priced from $450,000 - $1,500,000. The development sold $100 million in stock, selling 141 of its 197 apartments within two hours of launching in May 2014, and sold all apartments off the plan. DKO created a sculptural and modern façade for Eve, distinguished by its white glazed-brick exterior and curved entrance. Dark brown brick composes the base of the buildings while white bricks make up the walls with white stucco forming the balconies. Black metal trim provides contrast, defining windows and doorways. Bronze trim punctuates sections of the exterior. “We wanted to create a local landmark but with a sophisticated approach. As with all of its projects, Fridcorp was insistent that the development’s design integrity not be compromised, especially when it came to the design and construction of the entryway’s sweeping curves, consisting of textural brickwork that lines the ceiling and flows down the walls of the entry way. In addition to rethinking the street corner with the curved archway, DKO reconsidered the standard approach to apartment design and made a section of the ground-level apartments along Pearl, Zenith and Macdonald Streets outward rather than inward facing, inserting a European-style stoop that presents a pleasing interface between the building and the public, as well as creating seven lobbies throughout the site. Eve’s secluded, landscaped courtyard with built-in timber seating provides an opportunity for neighbourly engagement, a detail that is especially important in growing communities. Mature trees and plants fill the large, concrete raised planters and line the gently winding pathways that lead to Eve’s respective buildings. Sydney-based firm 360 Degrees is responsible for Eve’s landscaping. The 1,000 square metres resort-style rooftop garden offers another vibrant communal space for residents and their guests to relax or entertain. Located on the site’s northern-most building, the rooftop garden is located on level four, providing a lush view of the beautiful rooftop deck to residents in surrounding buildings. From the rooftop, guests are treated to expansive views of Sydney’s skyline. The apartments’ sophisticated and restrained interiors were designed by Hecker Guthrie. The intelligent and efficient floorplans have wide frontages giving the apartments a spacious feeling. Full length windows allow natural light into the space, enhancing the amenity. Hecker Guthrie appointed the interiors with white oak floors and white walls, with home owners choosing from either a black or all-white colour palette. Rose gold-coloured accents, found in tapware, light fixtures and door handles, punctuate the apartments. Open plan living, dining and kitchen areas cater to the relaxed Sydney lifestyle as do the apartments’ deep balconies that are as large as 73m². Sleek kitchens, outfitted with Smeg appliances and marble and porcelain benchtops, provide a luxurious space for meal preparation and entertaining.